I saw pictures of these on pinterest and I just knew my oldest son would love them! I was right these were a hit. I can't believe how easy they were to put together and how good they tasted. I have already decided I will be making these for his birthday party! Preheat oven to 375 degrees. Cut hot dogs into 1 inch pieces. I got 5 pieces per hot dog. In a medium bowl, whisk together egg, milk, oil, cornmeal, and sugar. Grease a mini muffin tin. Fill each muffin cup 1/2 to 3/4 full. You'll have a little bit over, you can make some extra cornbread if you want. 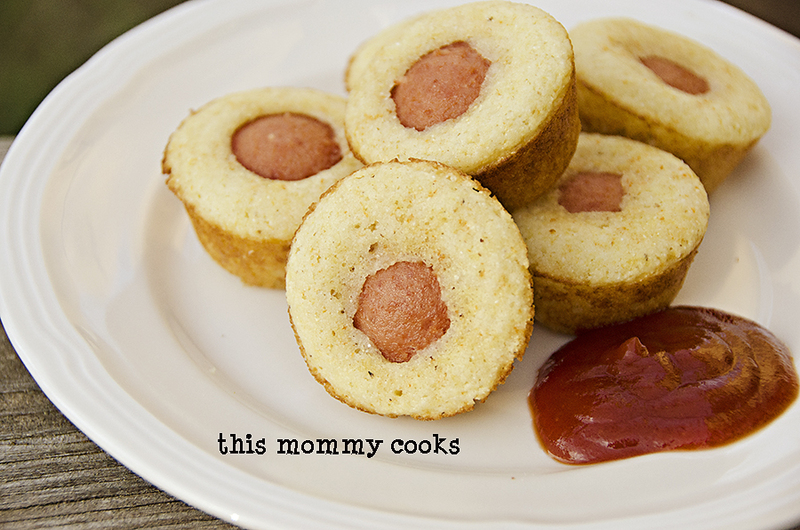 Place hot dog down into each corn bread mixture. Bake in preheated oven for 8-12 minutes. Serve with your favorite dipping sauces! I was thinking that I wished I had little kids to make these for a birthday party - but then I thought they'd be fun for an adult birthday party too! It's my husband's birthday this weekend, how do you think they'd be kicked up with a little japapeno pepper? Lyndsay, I bet they would be great! I made them and the kids loved them but I did hit a few snags. I didn't have extra batter, I used a 24 mini muffin pan. My muffins came out very soft and the batter looked very soft too. The box mix suggested adding 1/3 cup milk but I added the 3/4 cup like your recipe suggested. I also cooked them for 15 min because thats how long it took for a tester to come out clean on the ones with no dog. Maybe I will cook them longer next time. I used 3 hot dogs that I had in the frig. ( one dog filled 6 muffins. I used hebrew national.) Thanks for the idea, I'll definitely try it again. Thanks for sharing your experience. I didn't use a box mix, so I don't know if that had a bit of difference. I'm glad your kiddos liked them! I made these with a mix and they were so dry that my family wouldn't eat them. I went by the package directions. Maybe I should use a different brand or just make them from scratch. Not sure....any suggestions? Shannon, I would try making your own mix or maybe a different mix. Adding oil will help keep them moist too. Also, when you make anything mini, they don't need as much baking time so there is more of a possibility of over-baking them. My kids and even me, LOVE these! Definitely try again, because they are so easy and a favorite in our house! Thanks. Good chance I did overbake them and I'll make my own mix today. Hopefully that'll work because this is the neatest idea especially for lunch boxes and my son LOVES corn dogs.